Preview of the song “Yoiyami no Uta” is now available! Today, a preview of the song “Yoiyami no Uta” from the upcoming 7th Story CD Märchen has been published at the exceptional site, as well as a message from Revo announcing the release and the upcoming concerts. 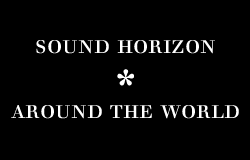 That last part stands for “In that dazzling times when you’ll be laughing…”, which is a quote to the last verse of the song “Hikari to Yami no Märchen” from the prologue single. Remember that you can preorder your Märchen album at CDJAPAN.CO.JP, and if you do it through the links of this fansite, a little comission will go to us in order to purchase a domain! 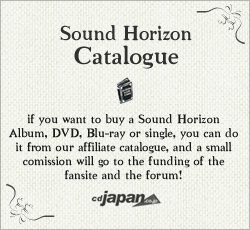 Next postHappy birthday Sound Horizon! + Our present is now at the SH Office!